Dr. Annick Swenson has spent years in the Amazon developing a mysterious new drug, and the pharmaceutical company she is working for wants to know the progress on their investment. After Dr. Anders Eckman dies trying to get Dr. Swenson to finish her research Dr. Marina Singh, his coworker and a former student of Dr. Swenson’s, is asked by Anders’ widow to find out the truth about what happened to him. When Marina finally reaches the jungles where Dr. Swenson does her research, the truth about Anders’ death and Dr. Swenson’s drug are beyond anything she could have imagined. After reading Bel Canto, I was excited to read something else by Ann Patchett. Unfortunately, the beauty and magic of Bel Canto was noticeably absent from State of Wonder. The first half of the novel, while Marina is still in Manaus waiting to get past Dr. Swenson’s gatekeepers Jackie and Barbara Bovender, is very slow and boring. Marina adjusts to the heat, dodges the torrential rains, and suffers terrible nightmares from Lariam, an antimalarial drug. That’s about all that happens until she finally meets Dr. Swenson. From there the novel gets a little more interesting, as Marina learns about the truth behind Dr. Swenson’s drug and begins attending to the Lakashi, the natives whom Dr. Swenson has been studying. But Patchett’s language, which was so beautiful in Bel Canto, feels off in places, which makes it hard to really get into the novel. Another problem is that I, again, correctly guessed several of the “twists.” There were moments when I would find myself rolling my eyes at something that happened, and I would wonder why Patchett didn’t choose something less obvious. Toward the end of the novel, several of the decisions Patchett made upset me to no end, and if it weren’t for the fact that I was almost finished reading, I would have given up on the book right then. While the novel’s premise was interesting, the plot didn’t live up to the expectations I had. 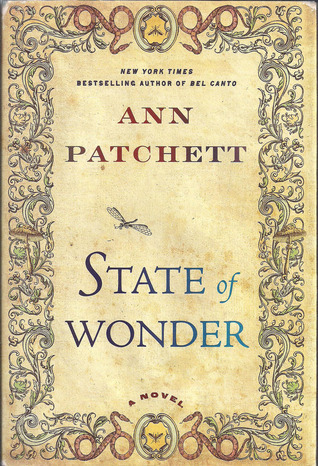 State of Wonder was a decent read but, in my opinion, Bel Canto is Patchett’s masterpiece. Tagged ann patchett, bel canto, state of wonder.